We’d love your help. 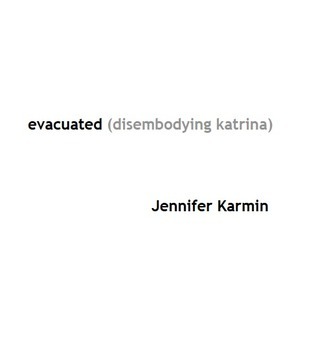 Let us know what’s wrong with this preview of Evacuated by Jennifer Karmin. Poetry. Part of the third Dusie Kollektiv. The complete issue is available at dusie.org. Jared Hayes, Cara Benson, Amy King, Emma Phillipps, Arielle Guy, Jane Sprague, Ana Bozicevic, Anna Moschovakis, Kaia Sand, Anna Fulford, Samar Abulhassan, Mackenzie Carignan, Zoe Skoulding, Catherine Meng, Ann Bogle, Susana Gardner, Bonnie Jean Michalski, Michelle Poetry. Part of the third Dusie Kollektiv. To ask other readers questions about Evacuated, please sign up.